Greetings everybody! I know the previous contest has ended and I am back with more contests! Thanks to Brand's Essence of Chicken, we have more prizes to be given away! So over the next 7 days, I will be posting three images. They will be released sometime in the day or night so keep your eyes glued to my tweets and be the fastest fingers and eyes first! Over the next 7 days, three images will be posted, and for each image, be the first to spot all of the bottles of BRAND’S® Essence of Chicken hidden, and stand to win a pack of BRAND’S® Essence of Chicken, and a $50 Takashimaya Voucher! To participate, simply comment on this blog post where you think the bottles are! 1.One winner per image posted. 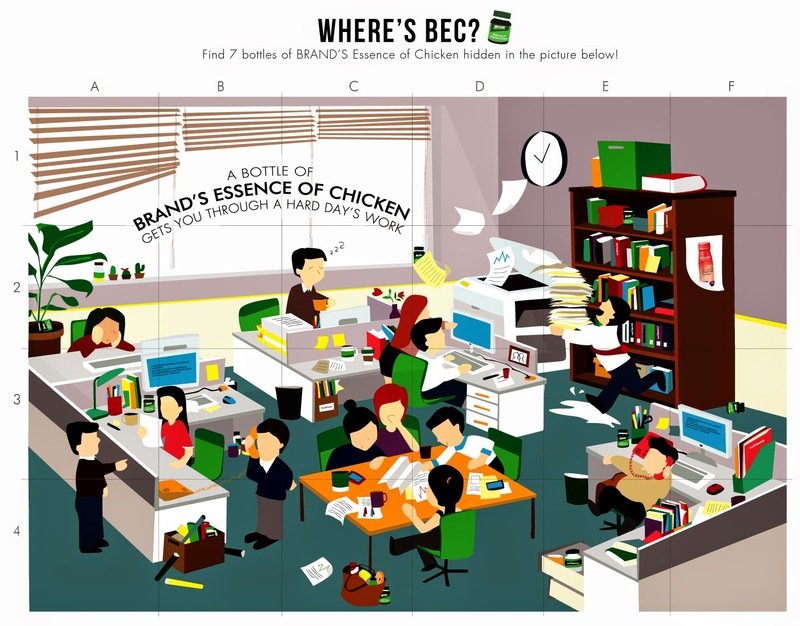 2.The first to spot all the bottles of BRAND’S Essence of Chicken wins for that specific image released. 3.Should none of the participants spot all of the bottles of BRAND’S Essence of Chicken, the participant who spotted the most number of bottles wins! Since today is the first day, I give a simple image. Comment with the coordinates of the BEC! Please leave your name and email on the comment section so I can contact you! Lucky seven! Good luck to all! Grid A2, A3, C4, D2, E1, E3, F3.